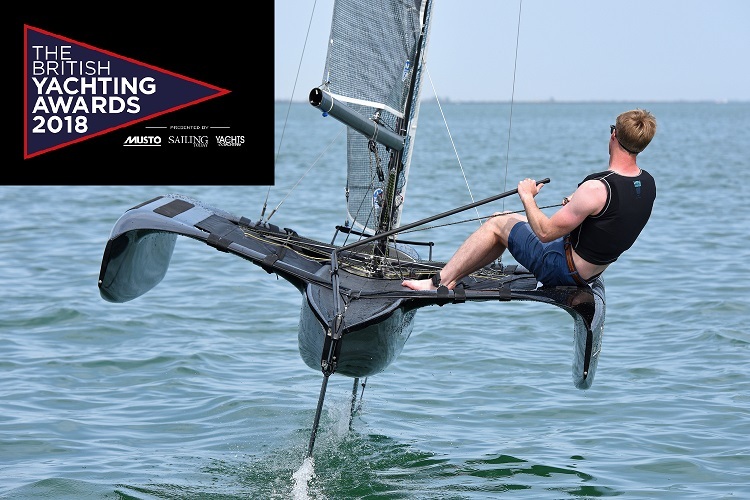 “The Flying Mantis – from British designer Jamie Stewart – offers foiling for mortals by creating form stability via two floats/extra hulls. This 14ft lightweight carbon trimaran can also be sailed with a regular rudder and daggerboards, depending on conditions, and can accommodate taller and heavier sailors up to 120kgs. The winner will be announced on Tuesday 11th December at the Royal Thames Yacht Club, London and the results will be published in Yachts & Yachting and Sailing Today magazines. We are really excited and proud to announce that the Flying Mantis has been nominated as “Dinghy of the Year” in the British Yachting Awards 2018. Sam Whaley, British Sailing Team "Really loved the boat. Had the elegance of a Rolls Royce with the speed of a Moth! Very impressed."